Have you ever been to St James Cavalier? Do you know where Victoria Gate is? And have you ever seen the large bell hanging in the monument commemorating the George Cross? No? Then you should Discover Valletta. Discover Valletta takes you on a journey through the fascinating history of our capital city. If you are a student in Form 1, or have been a Form 1 student in the last two years, you should have received a Discover Valletta pack which offers a fun tour unlike any you have had before! 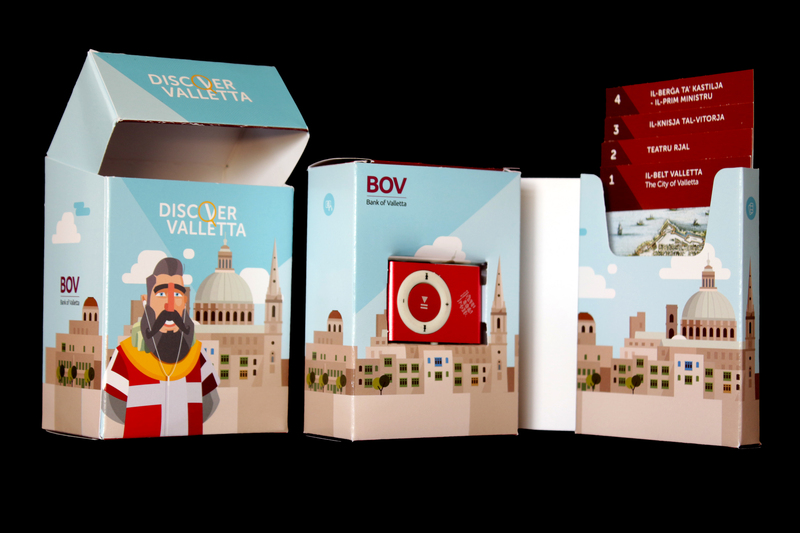 Inside the little box you will find a map of Valletta showing the 24 locations you should visit. Walk to a location and look inside the pack for the matching fact card which provides historical information and fun facts in both Maltese and English. Then put on the headphones for the mp3 player and listen to an audio clip with cool stories and more information written in Trevor Zahra’s unique style. So when you come to Valletta to participate in ŻiguŻajg and watch one of its amazing performances, bring your Discover Valletta box with you and go discover the hidden gems of our city. Discover Valletta is a Valletta 2018 initiative, sponsored by Bank of Valletta and fully endorsed by the Ministry of Education and Employment. Qatt mort il-Kavallier ta’ San Ġakbu? Taf fejn hu l-Bieb Victoria? U qatt rajt il-qanpiena kbira mdendla fil-monument li jfakkar il-George Cross? Le? Allura ‘Skopri l-Belt Valletta’! ‘Skopri l-Belt Valletta’ (Discover Valletta) tieħdok fuq vjaġġ fl-istorja affaxxinanti tal-belt kapitali tagħna. Jekk int student tal-Form 1, jew kont student tal-Form 1 f’dawn l-aħħar sentejn, suppost irċevejt il-kaxxa ‘Skopri l-Belt Valletta’ li toffrilek mawra divertenti li qatt ma mort waħda bħalha qabel! Fil-kaxxa żgħira għandek issib mappa tal-Belt Valletta li turi 24 post li għandek iżżur. Imxi sa wieħed minn dawn il-postijiet u fittex fil-kaxxa għallfact card li tikkorrispondi mal-post u li tipprovdi tagħrif storiku u divertenti dwaru bil-Malti u bl-Ingliż. Imbagħad ilbes il-headphones għall-mp3 player u isma’ siltiet qosra bi stejjer interessanti u aktar tagħrif miktubin bl-istil uniku ta’ Trevor Zahra. Għalhekk, meta tiġi l-Belt biex tieħu sehem f’ŻiguŻajg u tara xi waħda mill-wirjiet meraviljużi li jkun hemm, ġib miegħek il-kaxxa ta’ ‘Skopri l-Belt Valletta’ u mur skopri l-ġawhar moħbi li għandna fil-Belt tagħna. ‘Skopri l-Belt Valletta’ hija inizjattiva ta’ Valletta 2018, sponsorjata minn Bank of Valletta u endorsjata mill-Ministeru tal-Edukazzjoni u x-Xogħol.